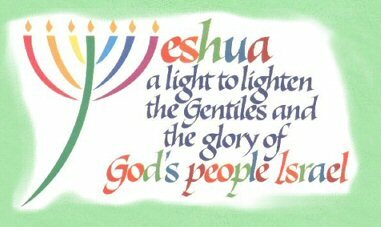 Old Testament - Today in Deuteronomy chapter 7, the New Living Translation has the chapter titled "The Privilege of Holiness." Keep in mind that these chapter headings - or headings within sections of chapters - are not Biblical text. They are not from the original manuscripts, but are basically brief summaries from the viewpoint of modern-day translators. Generally speaking though, you can trust what they are telling you - but just remember, they're not Biblical text. All this to say, I was intrigued by this chapter's title in today's readings. Israel was indeed privileged and called to holiness. I think an important for us to keep in mind is that in the Old Testament, Israel was God's chosen people. So, yes, we do read in this chapter and future OT chapters God favoring Israel over all other nations. However, keep three things in mind. One, Israel is the people of God's covenant going to back to Abraham and God is just forming Israel as a nation. Two, the other nations at that time were immersed in sin and idolatry to other gods. Three, through Jesus' ministry, God indeed shows love toward all nations today and wants all nations to be in relationship with him. But, prior to Jesus, we see clearly in this chapter that Israel is, per verse 6: "a holy people, who belong to the LORD your God. Of all the people on earth, the LORD your God has chosen you to be his own special treasure." Today in Deuteronomy chapter 8 verse 10 we read: “When you have eaten and are satisfied, praise the LORD your God for the good land he has given you.” What a great verse! Many say that it is because of this verse that we traditionally say grace at meal time. Interesting that this verse indicates that the Israelites were to praise God after eating – which, actually, is sometimes how I say grace today now too – when I forget to say grace before eating! :) I think the other thing this verse above gets at is that we humans have a tendency to “forget” God in the good times. 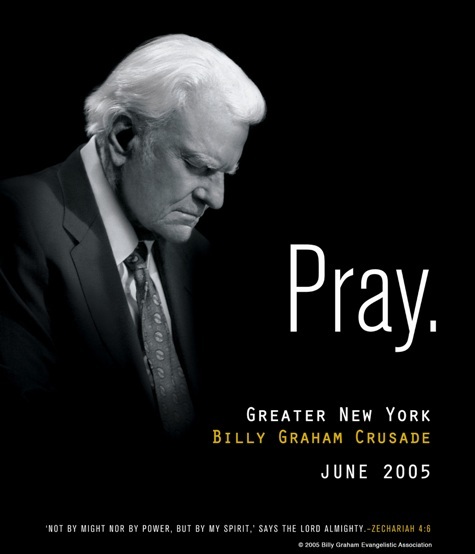 In the bad times, maybe we do a decent job of praying to God and trying to stay close to Him. But in the good times, I know that sometimes I can forget Who really blessed me with the good times. I think it is so important for us to remember each and every day this one thing – God has given us everything. Every single good thing we have in our life comes from God. Our family. Our friends. Our physical abilities. Even the very air we breathe. It ALL comes from God. 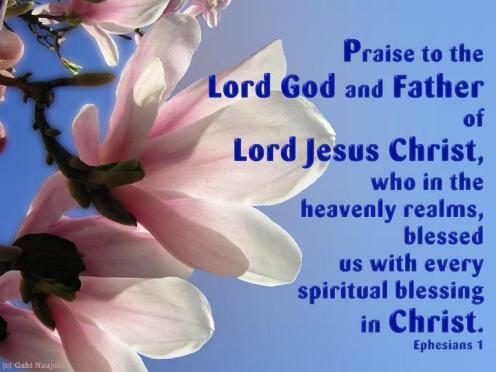 And, while I think it is pleasing to God for us to praise him for these good things – I also think it is ultimately healthy for us to praise God for the good things he has given us. Because, when we truly thank God each and every day for even very simple things – our eyesight, our 12 year old car that still runs fine, etc. etc. – we realize how very blessed we really are, and then I think we have less of a chance of feeling sorry for ourselves. We are blessed! How are you doing on praising God for the good things he has given you in your life? Now that we are in this Easter & Spring season, will you make a conscious effort to really praise and thank God each and every day? Think this might be pleasing to God? Think this might be healthy for you? New Testament - In Luke chapter 7 today we read about the "immoral" woman who kissed and put perfume on Jesus' feet. Verse 39 is a powerful testament to Jesus' character - "When the Pharisee who was the host saw what was happening and who the woman was, he said to himself, "This proves that Jesus is no prophet. If God had really sent him, he would know what kind of woman is touching him. She's a sinner!"" How ironic... this Pharisee thought that Jesus was not sent from God because he let a sinner touch him - when indeed it is this very act that proves that Jesus was sent from God! Jesus loved everyone - and still loves everyone today - and wants to be in relationship with all of us. No matter what this woman's sins were. No matter what our sins were or are. Jesus loves us and wants to be in relationship with us. Like the woman in this story, will we humble ourselves and come before the feet of Jesus? And will we ignore those who might suggest we're not "good enough" to be in relationship with God or Jesus? Remember, Jesus came to call the sinners, the sick - and not the righteous. Let's not act righteous before Jesus, but come to his feet as we really are and worship Him for who he truly is! Luke chapter 8 readings today are important for us to pay attention to. 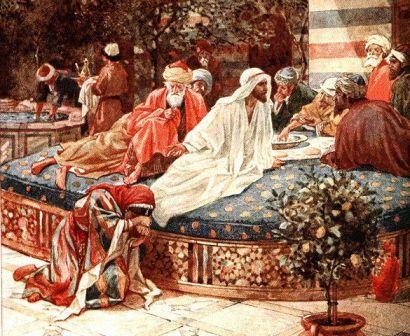 Oftentimes I think we sometimes think that it was just Jesus and the twelve male disciples cruising around the Holy Land during Jesus' ministry. Today's verses are a great reminder of the involvement of women in Jesus' ministry both by traveling with him and by contributing from their own resources to support Jesus and the twelve! Verses 1 through 3 tell us today - "Not long afterward Jesus began a tour of the nearby cities and villages to announce the Good News concerning the Kingdom of God. He took his twelve disciples with him, along with some women he had healed and from whom he had cast out evil spirits. Among them were Mary Magdalene, from whom he had cast out seven demons; Joanna, the wife of Chuza, Herod's business manager; Susanna; and many others who were contributing from their own resources to support Jesus and his disciples." 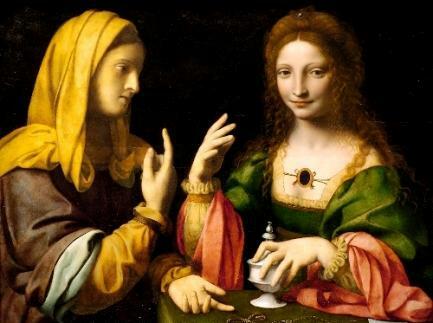 Below is the Italian painter Bernardino Luini's "The Conversion of Magdalene", circa 1525. Luini's painting shows Martha, Mary's sister, on the left pointing toward heaven; Mary, to the right, repeats the gesture to indicate that she too will follow Jesus. Bible.org's commentary on Luke chapter 7's readings today, titled "Wordless Worship of an Unnamed Woman" is at this link. Commentary on Luke chapter 8's readings today, titled "Ministry, Money and Women" is at this link. Proverbs - Wow... Proverbs chapter 12 verse 1 is so to the point and so true. Please meditate on this one - "To learn, you must love discipline; it is stupid to hate correction." Do you love discipline? Do you want to learn? Do you hate correction? What holy discipline might God be bringing to you in your life today? Will you accept God's healing and holy discipline in your life? Is God with you? Click here to receive Him! Comments from You & Questions of the Day: Based on Deuteronomy chapter 8 verse 10 above, do you say grace or offer up some sort of prayer of thanksgiving to God at each meal? Why or why not? Do you think it is pleasing to God when we do say a prayer at mealtime? Also, what verses or insights stand out to you in today's readings? Please post up by clicking on the "Comments" link below! Remember that God has not finished with his chosen people Israel, that their inheritence, as ours, is given by grace, not earned. We are added to Gods chosen people, we do not replace them, even though as a nation they are currently in sin, He will restore them at his appointed time. See Romans 11. I try not to make "saying grace" some ritual. It's important that we are always thankful for all He provides (kind of hard when He has blessed us with so much!). He sees our thankful hearts more than He hears our ritualized words. just the opinion of a sinner.